Ultimate Construction is based in Amersham, Buckinghamshire and – as a business like many others – we are very proud of the reputation and repeat business we have managed to achieve over the years. As a construction company that carries out both domestic and commercial work we cover a fairly large area, ranging from all of our surrounding towns to London, Reading, Oxford and beyond. As we live in an area that has a vast array of properties ranging from the beautiful Grade II listed properties in the old towns of both Amersham and Chesham to the latest newly-built properties in the surrounding areas, we have extensive experience in carrying out works in all of these different style properties. From a very sympathetic approach to having a wacky idea for your new home, Ultimate Construction is probably the right company for you to look at using. All of our trades are in-house: our electricians, plumbers, plasterers etc. which makes the project we are working on a much more efficient and smoother process for both you (the client) and ourselves. As a company we cover a large array of different aspects especially in the domestic sector. Regardless of how large or small your project may be, Ultimate Construction will not only build your new extension but design, source and fit your new kitchen or bathroom. 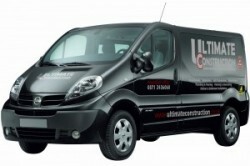 Ultimate Construction are on the approved installers list for the Bath Store UK. As floor specialists we also provide a very wide variety of different flooring to which our floor fitters will be more than happy to advise and show you many types of flooring that may suite your property whether it’s a solid oak floor, to an Amtico vinyl or a carpet, it’s up to you to choose. We work alongside respected architects and structural engineers, so should you need either for your project please feel free to ask and we will put you in touch! As Ultimate Construction is an approved GAS SAFE company we can install your new central heating system, change a boiler, or just simply service your old one. Ultimate Construction feel it is vital that you the client enjoy the experience of having us around and by being able to provide these services, you shouldn’t have to worry about having different parties involved in your project, therefore making it a much easier and stress free experience for you!